I was watching Robert Morris this morning “What’s so Amazing about Grace” sermon. He gave a definition of grace as “the unmerited, undeserved, unearned kindness and favor of God.” It struck me, and was completely untied to the message that God always gives us a chance to walk out, to be like Him, here on earth. He asks us to give grace. We often use grace as giving kindness and tolerance to others. Someone makes a mistake and we offer them grace – letting them off the hook. We are being like the characteristic of God in that He is tolerant and kind to us when we make mistakes. He offers us that grace, but His grace is so much more. Other times we use grace as a blessing. We say grace over our food or for things that we are thankful for. God certainly blesses us, and Jesus also said grace over food. God offers us His blessing, but His grace is so much more. As I thought about the definition given for grace, I thought we are most like the true definition of grace when we give to charity. Charity is defined as the voluntary giving of help, typically in the form of money, to those in need. Charity is unmerited, undeserved, unearned kindness and favor given here on earth. I was convicted a little under this thought, because there have been times where the mentality of “they need to earn it” or “they got themselves in to the situation.” has come out of my mouth when presented with the opportunity to give charity to certain individuals. Thinking to my self that “they do not deserve” help for some reason. Thank God that He doesn’t look at me and say “Not helping you” because He knows I have done nothing to deserve any of the kindness and favor He has given me in life. God’s grace in unmerited. There is nothing that I can do to deserve God’s grace. I can not be good enough to merit His grace. I can not be bad enough to warrant Him not giving me grace. Romans 11:6 And if by grace, then it cannot be based on works; if it were, grace would no longer be grace. The other aspect of grace that is seldom talked about is that God’s grace empowers us to overcome sin. Romans 6:14 For sin shall no longer be your master, because you are not under the law, but under grace. Through God’s grace, I am empowered to live differently than I could on my own under the law. So it is with charity, when we give, we are enabling others to live differently – whether it’s providing a meal to eat, a roof over their head, clothes on their back, a better education, etc. Due to the unmerited, unearned, undeserved gift of another someone is able to do something they could not have done on their own. That is grace walked out. What if I am robbing myself because I am failing to walk in His grace because of my own judgmental attitude? What if I am stifling my own growth to be more like Him because I am unwilling to offer true grace to others not based on their action or inaction, my perceived view of their worthiness of unmerited blessings? What if He wants me to give so that He can give to me, but my hands are so full of what I won’t let go of that He is just waiting? What if the answer to my prayers is waiting on the gift hidden in another who lacks the opportunity or resources to see their purpose fulfilled? His word says “And if you give even a cup of cold water to one of the least of my followers, you will surely be rewarded.” Matthew 10:42 What if He is waiting on me to give charity and walk out His grace, like the good Samaritan? 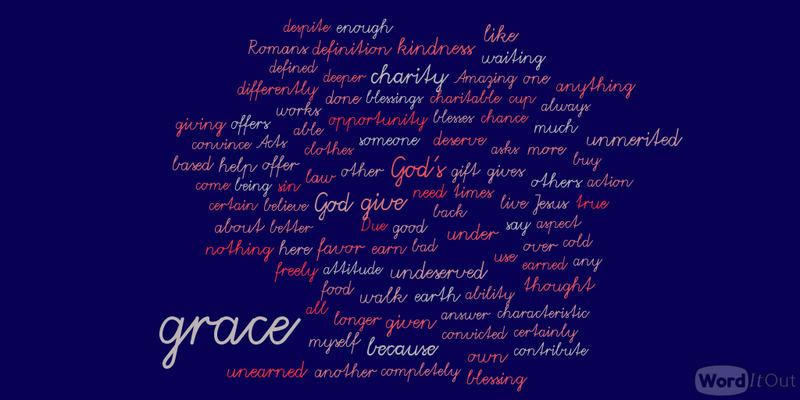 This entry was posted in Faith, Hope and tagged Character, Grace, Lessons, Messages, Obedience. Bookmark the permalink.